Paper presented at the International Conference on Countering Terrorism through Enhanced International Cooperation Courmayeur, Mont Blanc, Italy, 22-24 September 2000. This paper deals with the financing of Islamist terrorist groups in the Middle East. It is these groups that have in the past decade become the center of terrorist activity in the region and elsewhere in the world. Furthermore, we can trace in the last two to three years a shift of Islamist terrorist influence from the Middle East to Central and Southern Asia. This shift is the result of several main factors. 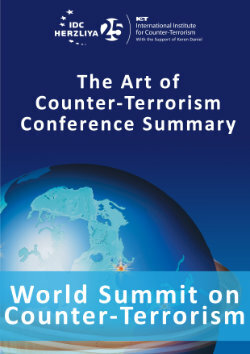 Among these, we can cite the fall of the Soviet Union; the Soviet defeat in Afghanistan; the Oslo Accord and the expected process of reconciliation between Israel and the Palestinians; the rise of national and nationalistic feelings in Southern Europe and the Balkan; and better cooperation of Middle Eastern countries in countering terrorism, even between Israeli and Palestinian security service. All this has caused a re-centering of Islamist terrorist activity from the heart of the Middle East eastward and toward the Balkans—Bosnia, Albania, and Kossovo; toward the Caucasus—Chechnya and Dagestan; and lastly toward Asia—Uzbekistan, Kashmir, Afghanistan, and the Philippines. There is kind of nationalist-Islamist terrorism even in Xinjiang in Western China, carried out by Uighur nationalists and Islamists. This shift is part of another process of the globalization of the Islamist struggle. However, to date, this shift in the focus and axis of Islamist terrorism has not changed one important fact: the ideologies, cultural influence and religious justification for this kind of terrorism still emanate from the Middle East and the Arab World. As long we are facing Islamist terrorism, the Arab Muslim World remains the source of what we may call the “Islamist culture of terrorism.” Two of the most prominent phenomena of the 1990s are ample evidence of this: the phenomenon of the “Afghan Alumni”/ “Afghan Arabs,” and the spread of Islamist Suicide terrorism as a religiously legitimate Modus Operandi, from Lebanon and Israel to Turkey and—this last year—to Chechnya and Kashmir. This paper does not deal with Islam or Islamic groups in general, or with the notion of confrontation between Islam and the West. Instead, it examines the views and perceptions of Islamist terrorist groups towards Western culture and the way in which these groups present this confrontation as a clash of civilizations or Islam vs. the West. For this reason, this paper uses the term “Islamists” or “Islamist terrorist groups.” This term applies to those Islamic groups that use the radical and militant interpretation of Islam in order to portray the religious duty of Jihad as meaning the use of violence and indiscriminate terrorism. These groups often misinterpret Orthodox Islam and many of their perceptions are in dispute in the Arab and Muslim world. And yet, they influence many believers all over the Muslim world as well as Muslim communities in the West. This influence is the consequence of a combination of political, social, economic and cultural confrontations under the guise of religious expressions. Financing and fund-raising are difficult topics for research when dealing with organizations in general, to say nothing of clandestine ones.The tendency of both the individual and community is to keep this issue private, far from public eyes. Dealing with clandestine groups is naturally much more difficult, and in the case of Islamist terrorist groups, perhaps the most difficult of all. These groups are in many cases unique, compared to other kinds of known terrorist groups, such as nationalists, Marxists, or Anarchists. This uniqueness is the consequence of two main factors. One is the Islamic religious element in which charity is one of the most important duties and is used as the primary means to disguise financial activity. The other is the relatively widespread support given to the Islamic movements and organizations for political, social, or cultural reasons. Above all, there is the fact that these are religious groups, or at least pass themselves off as such. This is of great benefit in a society in which Islam is deeply rooted and highly respected among the vast majority of the Arab and Muslim World. This religious element is most important in the case of the financing of terrorist groups. In recent years there has been a decline in the sponsoring of terrorism by states, as pointed out in the 1999 report, “Patterns of Global Terrorism” published annually by the US State Department. What this means is that public support for terrorist groups has become the most essential element in fund-raising and the main source of finances. Indeed, contrary to what many might think, public fund-raising from individuals is the most important element in the finance of many institutes, associations and public organizations. This has been shown by researches and surveys in the U.S. We should therefore focus on this point too with regard to the finance of terrorist groups in the Middle East. Islamic and Islamist movements and groups have succeeded in the past three decades in fostering in Arab and Muslim societies the notion of a kind of global cultural war, in which they confront a global conspiracy against Islam as a religion, culture and way of life. Thus, concepts synonymous in the Western political culture with terrorism and political violence are now viewed by many in the Islamic world to be Islamic religious duties. Such concepts include Jihad, Takfir (refutation), Istishhad (Martyrdom, including by suicide), and Shahid (Martyr). The central notion, common to most of the Islamic movements and groups—those that carry out terrorism and political violence, and those that justify it and feed the atmosphere that promotes such activity—is that of being in a state of siege which calls for self defense. To the believers in this concept, the confrontation justifies the use of all means—particularly when these means are given religious legitimacy. Many of the Islamist and Islamic movements and groups have succeeded in convincing many in the Muslim world that they represent the true contemporary interpretation of Islam. Moreover, most of these groups developed out of the perceived need to return to the fundamental sources of Islam. Thus, they based their views on Islamic scholars like Ibn Hanbal (7th Century), Ibn Taymiyyah (14th Century), and Ibn `Abd al-Wahhab (18th Century), who were the leading fundamentalist religious scholars, as well as the most unyielding in doctrine. The success of the Islamist movements lies in the basic diversity of Islam. However it also owes much, on one hand, to the lack of a single Islamic center that enjoys the confidence of the vast majority of the Muslim World, and the control of the modern secular regimes in the Muslim World over the religious establishments, on the other. Those establishments are viewed by large parts of the public as civil servants of the secular state, whose interpretations and rulings conform to the interests of the state. Thus, Islamic and Islamist groups and individuals have become the spiritual guides of quite a large population, and maintain a great deal of power and influence. Most of the Islamic movements and groups, primarily those that emerged during and after the 1960s, present the Arab and Muslim regimes—and in some cases rightfully—as symbols of arbitrary oppression and the distortion of the social justice rooted in Islam. Thus they encourage their followers to sympathize with and support those who present themselves as the protectors of the weaker elements of society. In many cases they manage to recruit to their side elements of social, political and cultural protest against Arab and Muslim regimes. These elements also see themselves as standing against the alleged global conspirators: The United States, Israel, the Jews, Western “Crusader” heretic culture, etc. At the base of this phenomenon lies the inability of large sections of Muslim publics to cope with the technological, cultural, or economic aspects of Western modernization. This has brought about the tendency to blame the secular cultures that have given rise to these regimes on one hand, and to find salvation in the return to Islam and its glorious past—a kind of “Messianism” that gives hope for a better future, on the other. Since Orthodox Islam is identified with the Islamic establishments of the modern nationalist secular—sometimes even revolutionary and socialist—states, the support was given to those who represented the opposite culture: the activist alternative that stands against the state. The Islamic social-political revival, particularly since the 1960s, is linked both to social changes in the Arab and Muslim World, and to the formation of an educated middle class in different countries. This middle class has in part distanced itself from the Western secular modernization and the institutions of the modern state: the military, government, economic institutions controlled by the state, the public media, etc. Another part of this class, mainly professionals with respected professions such as physicians, lawyers, pharmacists, engineers, academic scholars, or merchants who have suffered from the tendency to nationalize the economy by the state, have found in the Islam propounded by modern Islamist trends the solution to their problems. This process created a large and highly educated group of individuals, who saw themselves as a social Avant-garde, and who based their struggle on Islamist theories of historical trends. The next stage was characterized by massive activity within the existing Islamic groups, along with the formation of new Islamic groups, followed by the publication of new ideologies that did not necessarily correspond with Orthodox Islam. Many of these newer ideologies won numerous adherents in the course of the ensuing violent struggle. Thus there emerged popular ideologues such as Sayyid Qutb, the engineers Shukri Mustafa and Muhammad `Abd al-Salam Faraj, and Dr. Ayman al-Zawahiri and Dr. Rifa`i Ahmad Taha in Egypt. In Afghanistan and Saudi Arabia, the struggle was championed by Dr. `Abdallah `Azzam and Osama Bin Ladin. In addition there were the Palestinian Dr. Fathi Shiqaqi, Omar Muhammad Bakri in London, Dr. Hasan al-Turabi in the Sudan, the Tunisian Rashid al-Ghanushi now in exile in London, the Syrian Dr. Issam al-`Attar in Germany, and others. Alongside these ideologues there emerged individuals of high Islamic religious education who encouraged the new radical Islamic perceptions and gave their counterparts religious legitimacy. These included Sheikh Omar `Abd al-Rahman in Egypt, who is now serving a life sentence in an American prison, the Egyptian Yousef al-Qardawi now in Qatar, Dr. Yousef al-`Azm in Jordan, Fathi Yakan and Sa`id Hawwa in Syria and Lebanon, Muhammad al-Albani in Syria, and the Palestinian As`ad Bayyoud al-Tamimi in Jordan. These groups and movements carry out the vast majority of political, social, cultural and educational Islamic work, both in the Muslim world and among Muslim communities in the West. Therefore, they serve as the most important element in creating and preserving the “Islamic atmosphere” that is used by more extremist and violent Islamist groups. They are in many cases a greenhouse for the emergence of violent groups and the preservation of worldviews of hostility towards the West or Western culture. The infrastructure—whether social, political, cultural, educational or charitable—of these movements is the main venue for the financing of Islamic projects. As such they can be used also, as by-product, for the financing of violent and terrorist groups. They are also most active in consolidating Muslim communities in the West, and therefore are the foundation for massive fund-raising by militant Islamist groups among these publics. The Islamic societies, whether in the Muslim World or in the West, together with the “Islamic atmosphere,” even if non-violent, thus play a crucial role not only in the financing social and cultural activities, but of Islamist terrorism as well. Social Islamic work is also in many cases part of social protest, either against secular Muslim regimes or Western societies—a protest that facilitates the activities of some of the Islamist groups. The Islamist “Terrorist Culture” can be sketched as a pyramid; at base there is the large-scale activity of the Islamic social and non-violent groups: associations, institutes, and projects of all kinds. At the head of the pyramid there are the terrorist groups. In the middle there are various processes that refine certain social elements into hatred, revenge, the search for power and violence. This violence is in many cases indirectly financed by innocent elements. The aforementioned factors are very important not only to the understanding of the Islamist phenomenon, but to the explanation of the complexity of the financial and economic system of the Islamist groups. To the above-mentioned factors we should add the significant involvement of Arab and Islamic states in the financing of Islamic activities—not only at social and cultural activities, but terrorism and political violence as well. On one hand, countries such as Iran, Saudi Arabia, Kuwait, Sudan, and Pakistan, give—whether directly or through official and unofficial foundations and companies—enormous sums of money to Islamic movements. This money goes to a wide range of Islamic organizations, and to foundations, associations, institutions, charity associations, projects, and institutes all over the world. Many of these bodies serve as front organizations for groups that engage in terrorism. On the other hand, most of this financing feeds—directly or indirectly—an atmosphere based upon violent Islamist perceptions, thus encouraging public support for the phenomenon in general, and for the various groups in particular. Very often, especially in the case of Saudi Arabia and some of the Gulf States, wealthy individuals donate a good deal of money to Islamic movements or projects directly or through private foundations. Although these donations are private, in most cases they come from officials or individuals of high public position in their countries, or even members of the royal families. The donations are thus perceived as part of governmental support. An additional factor that is of importance to the public support for Islamic movements and groups, including the violent ones, is the comparative confidence in matters of financial integrity enjoyed by their activists as men of religion or religious authorities. Most of these groups are generally perceived as dedicating their activities to the public interest, and free of corruption. Paradoxes such as the cultivation of narcotic plants and drug trafficking in order to finance Islamist groups in Afghanistan, Pakistan or Lebanon are forgiven in such societies. In these countries this is a legitimate enterprise, particularly if the narcotics are used for commerce and not for personal use or distribution among Islamic societies. Some Islamic groups that actually fight drug dealers engage in the treatment of drug addicts, sometimes publicly state that the distribution of drugs among the “infidels” is permitted, although there is no known public Islamic ruling that permits this. A few exceptions in this regard are small terrorist groups, whose Sheikhs pronounce religious rulings permitting robbery of non-Muslims for the financing of the group. Sheikh Asa`d Bayoud al-Tamimi, one of the religious authorities of the Palestinian Islamic Jihad, in 1983 issued a ruling permitting his followers to steal the property of Jews. In the course of the investigation that followed the assassination of the late President Anwar al-Sadat in October 1981, Egyptian Islamists from the Egyptian Islamic Jihad admitted robbing jewelry stores owned by Christian Copts in Cairo and Upper Egypt, based upon a religious ruling. In the trial of Egyptian Returnees from Albania, or “The Arab Balkans,” in 1999, members of the Egyptian Islamic Jihad confessed that some members had, while living in Jordan, Yemen, and Jeddah in Saudi Arabia, planned to rob jewelry shops in those countries. Unknown Sheikhs issued a special Fatwah for the purpose. It should be noted that they failed to carry out the plans because they could not obtain the necessary weapons, had no escape routes, and did not know how to sell the jewelry for cash or how to smuggle it. This means that they had neither the “criminal mind” nor any link to criminal circles. In the investigations that followed the arrest in December 1999 of a large group in Jordan linked to Osama Bin Laden and his Al-Qa`idah organization, some of the detainees admitted to planning the robbery of Christians in Jordan to finance their activities. It was not known whether they had a religious ruling for that. Some Islamists were involved in 1999 in the kidnapping of tourists in Northern Yemen for ransom, but it appeared that this activity was part of the widespread phenomenon of kidnapping among the Yemenite tribes there. Involvement of terrorism, guerrilla warfare, and criminal activity of Islamist groups is widespread in Chechnya and the Caucasus, as it was in Bosnia, Albania and Kossovo. But, it would seem that this is a result of the political and economic culture in those regions, and connected to nationalist groups that carry out a struggle more nationalist than Islamic in nature. Islamic organizations that engage in social and communal activity alongside their terrorist activities—such as Hizballah in Lebanon, Hamas in the Palestinian territories, Harakat ul-Ansar in Pakistan, and others—also enjoy public support and sympathy for their efficiency in assisting the public. In this, they usually perform better than their governments. The most prominent such groups in the Middle East are those that belong to the Muslim Brotherhood or their school. The Brotherhood developed a comprehensive organizational theory of the formation of a totally independent economic infrastructure. This economic activity is integrated in the religious duties of charity, and hence, is sometimes immune from the attacks of the hostile regimes. However, in many cases this same immunity provides the primary cover and legitimacy for fund-raising, the transfer of money and the financing of subversive or terrorist activity. There is a very important element in the financing of Islamist terrorist groups and the globalization of Islamist terrorism that has not yet been sufficiently observed by Western countries. This is the establishment of large Muslim communities in the West, and their growing alienation from the surrounding societies. Hatred of foreigners in the major countries in Europe, poverty and unemployment, difficulties in coping with Western modernization and values, clash of values and cultures, and disintegration of family values, have brought about an increase in social and political activity of Islamist activists in these communities. Islamic social and welfare movements, which are not part of the radical trend, help in creating the Islamic atmosphere that directly and indirectly assists the radicals, particularly in fund raising, recruitment of supporters and members, establishing all kinds of institutions, and distributing publications. Above all, they attempt to implant in growing Muslim societies in the West the perception of Western culture as the enemy—the party of the devil (Hizb al-Shaytan) set against the true believers, the party of God (Hizballah). An important example of the consolidation of Muslim communities has been led by the Pakistani Dr. Kalim Siddiqui, who lived for many years in London and directed the Islamic cultural center of the pro-Iranian circles there. Siddiqui, who was one of the first Islamic ideologues to talk about the globalization of the Islamic struggle, was behind the theory of the “Non-territorial Islamic State.” In the framework of this ideology he established in the 1980s the Muslim Parliament of the UK—an attempt to create an Islamic body to represent all the different groups of Muslims in the UK, who came from different Muslim countries and various Islamic sub-cultures and trends. He viewed the Muslim parliament not just as the minority political system for Muslims in Britain. The parliament was meant to be, first of all, the basis for the “Non-territorial Islamic State.” The key word for him was power—the State was the instrument by which a community could exercise its collective power in action. The “non-territorial Islamic state” may in the coming years become a major factor in Islamic communities in the West, both for the improvement of their own status, and as the backbone of certain Islamic and Islamist groups that fail to establish such a state in their homelands. The issue of financing would probably be a prominent factor too in socially changing societies that reside in materialistic surroundings. In many cases Islamist activists influence is greatest on those Muslim publics whose religious knowledge is poor. As a consequence of social pressures, these people tend to adopt motives that sometimes lack religious rules or norms, emphasizing instead the social and political confrontation. The radical perception of Jihad is therefore quite attractive to many of them. According to press reports quoting court papers of US prosecutors, this element has been used by Bin Laden through international companies and relief organizations acting as front organizations, in obtaining US residences, with which they could communicate by fax, satellite phones and coded letters. A good recent example of the use of Muslim communities in the West is the story of the Algerian Ahmad Rassam who was arrested on 14 December 1999 on the US- Canadian border. His arrest and subsequent arrests in the US and Canada, revealed a plot by the Algerian Armed Islamic Group (GIA in French) to carry out terrorist operations in different places in the US on the occasion of the Millennium. American investigators linked this plot to Bin Laden and his global struggle. Rassam was part of the growing Algerian community in Montreal, where according to press reports “people seeking refugee status can drop from sight despite arrest warrants and deportation orders.” He entered Canada in 1994 with a forged French passport and applied for asylum, claiming that he fled from torture and persecution. He did not show up at the hearing on his refugee claim and was therefore denied. He was arrested in August 1995 on an order of deportation, but was released after a month and was asked to arrange his status with the immigration authorities, which he failed to do. Only in May 1998 did immigration officials issue an arrest warrant for him. By that time, he was not to be found. In June 1998 he was arrested for theft but was not detained by the immigration authorities and again disappeared among the 30,000 Algerians living in Montreal. Statistics and data published by various bodies of the United Nations show a growing number of people from Muslim countries who seek refuge and asylum, mainly in Germany (40%), the United Kingdom, the Netherlands and France. The number of Algerians seeking refuge or political asylum in Europe in the years 1990-1993 for example increased from 1600 to 14,000 per year. In February 1998, the German Minister of Interior decided on a temporary ban on the deportation of Algerians in response to the upsurge in violence in Algeria. An estimated 6,500 rejected Algerian asylum seekers remained in Germany in 1998. The number of first-time asylum seekers in Germany in 1998 was 143,429, most of them from Muslim countries including Bosnia and Albania. This was a decrease from the 1992 numbers—438,191—but in general the number of Muslim immigrants to Germany itself was over one million people. Muslim immigrants to the US are a minority among the enormous number of immigrants from all over the world, but the statistics published by both the US and the UN show a significant increase in the past decade. The US is very active in seeking solutions by resettlement of refugees from areas of risk in other countries, but during the 1990s, Washington had to increase the admission of refugees to the US as well. Statistics of political asylum cases approved by immigration judges in the US between 1989-1999 show that only 22.4% of the applications were approved. But, in the case of Muslim countries, such as Bosnia, Afghanistan, Sudan, Somalia, Iran, and Iraq, the majority of the applications were approved. The increasing number of Muslim immigrants to Europe and the US is a result of the political violence in Muslim countries in the 1990s. In many cases those immigrants and asylum seekers were actively involved in violent events and may be easily affected by extreme radical Islamist ideas. In most cases the long-term goals of many radical groups are vague. They tend to speak in terms of an eternal global mission in accordance with the basics of orthodox Islam, whose victory, which, according to their belief is sure to come about, may be accomplished only in the far future. They also lack normal political observance, and therefore are not pragmatic except for in cases where they are confronted by force, as happened in the second half of the 1990s. When Arab regimes started to fight the Islamists by force, we have witnessed the start of a move from terrorist groups to the demand to become legitimate political movements and parties. This happened during 1998-99 in Egypt, Algeria, the Yemen, and partially affected the relations between Hamas and the Palestinian National Authority (PNA). A very important element in this regard was the significant decline of public support for these groups in their homelands, as a result of their murderous operations, mainly during the last years in Algeria. This was also the case following the operation in Luxor in November 1997 in Egypt, which shocked the Egyptian public and the Islamic establishment. But, this process is also part of the shift of Islamist terrorism to globalization. Islamist groups started targeting the growing Muslim communities in the West in order to seek support. A crucial element in the 1990s and if we look at the near future, is the massive fund raising for all kinds of Islamic activity in Europe and the US. In many cases the money is spent on social and cultural projects, either for the benefit of Muslim population in the West or in the Arab countries. But part of it is raised by various radical Islamist groups or by front organizations and institutions established by them. US officials reported that they have discovered that a significant number of Islamic terrorists were concealing their activities and sources of funds by using charitable organizations as fronts. Many of these charities do substantial community service work. Such investigations are not easy and can raise allegations of targeting religious or ethnic groups. An Algerian immigrant to Canada who was writing a doctoral thesis on Islamic groups claimed that Canada has served as a transit point for much of the $137 Million raised worldwide for the Islamic movements in Algeria. He found that GIA was using tactics ranging from special taxes to outright extortion to raise money funneled through Canada. The group had only a little support among the Algerians in Montreal, but exploited the freedom under the Canadian Rights Charter to operate in that country. The means of financing terrorist groups in the Middle East vary from direct transfer of cash to terrorist groups by special couriers, and a variety of legitimate bank accounts, to the financing of a wide range of associations, institutions for social and educational projects, hospitals, orphans and other humanitarian goals. The money is transferred to the Arab or Muslim World by means both sophisticated and secret, but in most cases legitimate, transactions—through bank accounts in Europe, North America, and the Middle East. Some of the Islamic institutions in the West are used also to launder large sums of money transferred from different countries or wealthy individuals, primarily in Iran, Saudi Arabia, Kuwait and some other Gulf states. During the 1990s this transfer of money has gradually increased. Following the decision by the Gulf States to cease financing the PLO because of its position in the Gulf war, these states shifted their financial support to Islamic groups, organizations and projects. This led to the foundation of many kinds of institutions, cultural centers, publications, research institutes and welfare associations one of whose main goals was fund raising and money laundering. This was in addition to the use of these organizations for the spread of radical Islamist messages among Muslim populations in the West. The financing of social projects in Muslim societies in the Middle East and, in the 1990s, in the Balkans, and in Central and Southern Asia is a controversial issue in many cases. The Saudi example in this case is the most controversial. On the one hand, the Saudi government is the greatest financier of Muslim relief organizations in the world. But, on the other hand, by doing so it in certain areas directly assists publics that support Islamist terrorist groups, thus indirectly assisting these groups. There are numerous reports concerning one of the Saudi official relief organizations—The International Islamic Relief Organization (IIRO)—that it provides financial support to Wahhabi groups in the Middle East and Central Asia. Other recent reports from the Philippine government even connect IIRO to Bin Laden, claiming that he uses the organization as a front for the financing of the Abu Sayyaf group and the MNLF. The reliability of these reports is not known. The issue of the financing of Islamist terrorism was raised in recent years mainly with regard to Osama Bin Laden, who appears in many documents, press reports—and probably intelligence report—as the wealthiest financier of terrorism currently active. In April 2000, the British Times published a report from British intelligence sources, concerning an investigation by the British security agencies of reports that Bin Laden “has been funding young British Muslims at armed training camps.” The reports claimed that “militant Islamic groups” recruited and sent 200 British youngsters to desert camps in Pakistan, Afghanistan, and the Sudan.” Some of them took part in battles and were killed. Bin Laden’s actual wealth is not publicly known, and the range of his wealth as reported by the Media is between millions and billions of $US. His family, which owns an empire of business companies in the field of constructions in Saudi Arabia, is indeed quite wealthy. However, the Saudi authorities deported Bin Laden in 1994, and since then he has found refuge in the Sudan and, after 1996, in Afghanistan. There is no reliable information about his real fortune and how much of it is invested in terrorist operations. Furthermore, in the past two years since the terrorist explosions of the American embassies in East Africa in August 1998, he has resided in a limited area in Afghanistan. Although he is secured by the patronage of the Taliban regime in Afghanistan, we may assume that his ability to run businesses from there is very limited, if it is possible at all. According to American intelligence reports Bin Laden is also suffering from several diseases of the bones and kidneys, and is due to be replaced as head of al-Qaidah in the near future by Dr. Ayman al-Zawahiri, the leader of the Egyptian Islamic Jihad group. Other reports claim that Bin Laden is even dying of liver disease. In fact, there are hints that his funding of terrorist operations is limited. For example, there is the case of the Jordanian group arrested in December 1999, which Jordanian authorities suspected of being linked bin Laden. In their confessions, as published in the Jordanian press, they confessed to planning robberies in order to finance their activities, and to receiving very small sums of money from abroad, no more than $2000 US. This may prove that Bin Laden did not finance them and that the reports about his financing of terrorist groups and operations are far from reality. This story was repeated in the case of a Palestinian Islamist group uncovered by Israeli security service in April-June 2000, whose leader was linked to Bin Laden. Most of their finance came from Hamas sources. In an investigation into an alleged Bin Laden network in the United States in 1999, about $11,000 was sent from the US to an Islamist activist linked to Bin Laden in the Middle East. In other words, the transfer went the other way: certainly not the way it is supposed to work in the case of a terrorist network financed by Bin Laden. In general, the issue of the financing of Islamist terrorism appears somewhat exaggerated in the media or in the rhetoric of politicians. This is a very difficult issue to research relying on open sources. It would seem that the vast majority of the money raised by Islamic movements, groups and organizations is spent on their social and welfare activity, rather than directly on terrorism. However, taking into consideration the afore-mentioned pyramid of Islamic activity, the Islamist terrorist groups and global Islamist networks, indirectly enjoy a good deal of support from this fund raising. This has started to decline in the past two years in the US, as a result of legislation and federal investigations, particularly in the case of the Palestinian Islamist groups, Hamas and the Palestinian Islamic Jihad. But none of the American steps has so far been taken in any of the European countries, which continue to be an ideal greenhouse for Islamist radical activity, and above all the UK. The countering of this kind of terrorism, even by legislation and other non-violent means, particularly by international cooperation, is crucial in the fight against radical Islamist terrorism. If European countries join the US in this field it could lead to the decline of the massive fund raising at the very least. British authorities took their first real move in this direction only recently, in January 2000. The British Charities Commission issued a ruling that stripped a charity associated with the Muslim Cultural Society of its tax-exempt status, and declared that the organization could no longer be called a charity. This charity was directed by Sheikh Omar Muhammad Bakri, a known ex-Tahrir activist in the Islamic circles in the UK, who heads a group called Al-Muhajiroun. British press reports claimed that he was also the head of the political wing of the Islamic Political Front (IPF), which has sent British volunteers to Pakistan, Afghanistan, Bosnia and Chechnya. The military wing of the IPF was allegedly founded by Bin Laden. A good example of the real goals of various Islamist institutions and centers established in the US and Europe in the last decade, is an internal document written in the early 1990s by activists of one of the most radical Middle Eastern Islamist groups, the pro-Iranian Palestinian Islamic Jihad. The document sets forth a comprehensive plan to establish a hostile intelligence organization in the US and elsewhere. Among other things it states, “Our presence in North America gives us a unique opportunity to monitor, explore and follow-up… We are in the center that leads the conspiracy against our Islamic world. Therefore, here we can monitor and watch the American policies and the activities of those questionable organizations, establish a center for studies, intelligence and information.” Part of the activities of this “center for studies” is “military training programs, benefiting from the available opportunities that exist in this country.” This institute has been under investigation by US authorities for the past five years. The most important elements in the financing of Islamist terrorist groups are the public support given by Islamic societies and communities in the Middle East or elsewhere in the Muslim World, as well as in the West, to the socio-political messages and interpretations presented by these groups under the guise of religion. The social element is important in the financing of these groups, since the social, welfare, charity, and relief activity is an essential element in the consolidation of communities that support such groups. Even in cases where Islamic societies or parts of them, do not support terrorism per ce, in many cases they support the atmosphere of anti-Western or anti-Jewish messages of Islamist terrorist groups. This factor is vital in the ability of terrorist groups in the Middle East, or Middle Eastern terrorist groups elsewhere, to raise funds, launder money through legitimate institutions, and maintain financial facilities. Among Muslim communities in the West there has been a social change in the past decade or two. The first generation of immigrants sought to merge into Western society and was much occupied with economic difficulties. The expectations of the second and third generations of immigrants were in many cases unfulfilled, reinforcing their alienation from the Western societies that surround them. Although in many countries, primarily the United Kingdom, Scandinavia and Germany, they were granted generous economic support, as well as freedom of speech and activity, organization and education, there was a flood of financial support from the wealthier Muslim countries that assisted them in building and promoting their own communities. The Westerners’ resentment of foreigners in their midst, and the ongoing difficulties of coping with modernization, unemployment and traditional culture, allowed a wide range of Islamic infrastructure to thrive in the Western democratic system, which could serve as a most suitable greenhouse for Islamist movements and groups and their financing. A variety of associations in London, or research institutes in the United States, for example, could serve as the backbone of terrorist Islamist groups for diverse goals: recruitment, fund-raising, publications, communications and so on. This element seems to reinforce the internationalization of Islamist terrorism in the Middle East or Asia. Thus, the growing feeling of alienation among Muslim youth is perhaps the most important factor in analyzing the prospects of future Islamist terrorism in general, and the financing of terrorist groups in particular. The list of Middle Eastern and Asian Islamic relief organizations is enormous, and most of them are active in Western countries, where the supervision over them is very difficult under democratic laws. Most of them have very active Internet websites to promote their activities, primarily among Muslim communities in the West. There have been only a few cases in which governments or security services succeeded in proving the link between such funds or associations and terrorist activity. In most cases there were investigations that led no where. Foundations like Interpal in the UK, Holy Land Foundation in Texas, USA, Al-Aqsa Foundation in Germany, and others, were subject to investigation without any real success. One reason for the lack of success was insufficient cooperation between countries, along with differing views on how to deal with terrorism in general, and with this kind of religious terrorism in particular. These differences exist not only between Western countries—particularly the European Commonwealth and the United States—but also between Arab and Middle Eastern countries. The disputes in the Arab world are especially detrimental to countering the financing of Islamist terrorist groups, since a major part of the financing comes indirectly from Arab governments, institutions or wealthy individuals. The issue of financing Islamist terrorist groups was in some cases a source of accusations of Arab governments toward other Arab states. A good example was the accusation made by the Egyptian government against Kuwait. On 9 December 1999, the General Assembly of the United Nations adopted the International Convention for the Suppression of the Financing of Terrorism on the initiative of France. So far, only 25 countries have signed the convention and no one has ratified it. The last one to sign so far was India, which signed in September. But, the convention can come into force only after 23 countries ratify it. This situation reflects the main obstacle for targeting the financing of terrorism: the absence of real international cooperation. This is not new, but the decline of sponsoring terrorism by states should make this cooperation easier to achieve, since national political interests and considerations towards certain states no longer exist. Countries like Russia, India, and China, joined the Western countries that for years suffer from Islamist terrorism, in the call for better cooperation, but the real advance in cooperation is still very slow. Wherein lies the problem, and what is the main obstacle? The “ordinary” obstacle lies in the different interests of different countries, and suspicion and competition in their relationships with Muslim countries. These are all natural factors in international relations. In the case of the war in Bosnia, Albania, and Kossovo, the Muslim rebels were the “good guys” and the Serbians were the “bad guys.” In the case of Chechnya, the “bad guys” are the Islamic rebels who are assisted by a battalion of “Arab Afghans” accused of links to Bin Laden. But the main obstacle the failure to deal with internal socio-political problems. This paper cannot cover the whole field of analyzing the solutions for the socio-economic problems of Muslim communities in the West or Muslim societies in the Middle East. But, in the narrow field of countering the financing of terrorist groups there must first of all be better understanding of the importance of the role of Islamic infrastructures as the main source of financial support for Islamist terrorist groups. Much better supervision over such infrastructures does not necessarily mean fighting Islam, even though Muslim communities and countries would like to present it as such. Such supervision must be accompanied not only by international conventions, but also by national and coordinated conventions in different Western and Middle Eastern countries. Legislation, such as that passed by the United States in 1996 and after, should be imitated by other countries and parliaments. A side benefit of such legislation would be better cooperation between countries. Last but not least, is the cooperation between countries in the field of intelligence. Information should be exchanged between polices and security services about institutes and associations that serve as financing bases for terrorist groups, and not only in the case of terrorist operations in progress, but on a regular basis. The globalization of Islamist terrorist networks should be followed by the globalization of cooperation in countering them. There have been only a few academic articles published on the issue. The best of them up till now is James Adams, “The financing of Terror,” in P. Wilkinson and A.M. Stewart (eds), Contemporary Research on Terrorism (Aberdeen, University Press, 1987). Most of the researches dealt with the IRA and Irish terror groups. See: John Horgan and Max Taylor, “Playing the “Green Card” - Financing the Provisional IRA,” Terrorism and Political Violence, Vol. 11, No. 2 (summer 1999), pp. 1-38. A good journalist survey of the financing of Islamist groups was published lately in English: Richard Labeviere, Dollars for Terror: The United States and Islam (New York, Algora Publishing, 2000). Translated from French (Les Dollars de la Terror) by Martin DeMers. It should be noted that even in “Patterns of Global Terrorism,” the annual report of the US State Department, there is no serious analysis of the issue of financing terrorism. The issue is also not really dealt with in the Arab Media in the Middle East. An outstanding example of openness in the Arab press is an article of `Abd al-Rahman al-Rashid, Arab News (Saudi Arabia), 11 October 1998. There were a few cases in which Islamist small groups planned to attack banks, not for robbery but in order to cause economic damage. The Egyptian Islamic Jihad, for example, planned to attack banks in Egypt because they did not follow Islamic Shari`ah. A member of the Egyptian group of Returnees from Albania told interrogators that the famous Fatwah of Ibn Taymiyyah against the Tatars applied to the banks. Al- Sharq al-Awsat (London), 8 March 1999, p. 10. In March 1999, the Egyptian authorities accused members of the group of “Returnees from Albania” in planting explosives in front of three Egyptian banks in 1994. Al-Sharq al-Awsat, 9 March 1999. The Fatwah was clandestinely sent from Jordan to the West Bank on audiotape. From the private collection of the author. See: Al-Sharq al-Awsat (London), 8 March 1999. Al-Rai and Al-Dustur (`Amman), 20 April-17 May 2000. Manila Times, 7 August 2000. For an interesting analysis of this Fatwah see: Magnus Ranstorp, “Interpreting the broader context and meaning of Bin-Laden’s Fatwah,” Studies in Conflict & Terrorism, Vol. 21, Oct.-Dec. 1998. The New York Times, 23 January 2000. For example, in two cases on 1990 and December 1992, a special courier arrived at Israel with suitcases of 100,000 US$ each, in order to give the money to Hamas activists. In his interrogation and trial he confessed that the money was aimed at the reorganization of the terrorist activity of the movement. But, it should be noted that the money was transferred for the terrorist activity and not for the social activities. This might mean that in the case of Hamas, there was total separation between the two fields of activity. Manila Daily Inquirer, 9-11Agust 2000. Al-Ra'I and Al-Dustur (Amman), April 20-May 17 2000. Al-Majallah (London), 12 September 1999. Internal document of the Palestinian Islamic Jihad. A private collection of the author. Al-Majallah (London), 4 September 1994.